Judging from the success of last year’s Aquaman, DC Movies seems to have realised something: laughter sells. 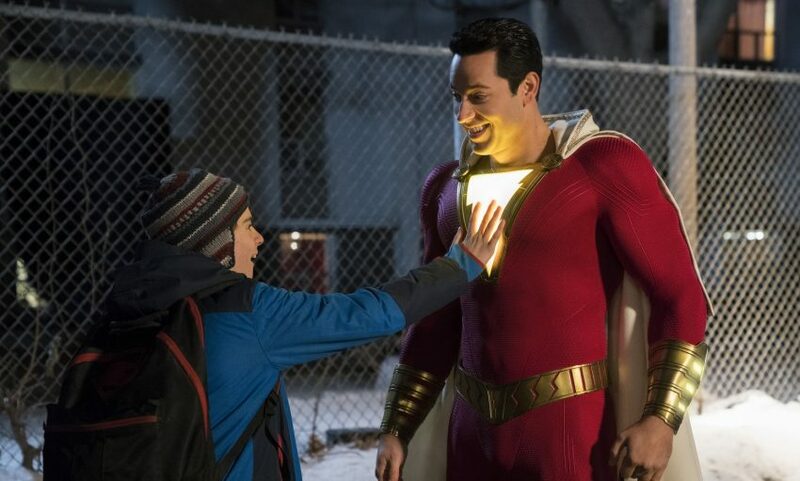 Considering that comedy and entertainment are among the reasons why the Marvel Cinematic Universe is so popular, it felt like it was only a matter of time before DC chose to lighten up – and they have taken a firm first step with Shazam!, the latest instalment in the DC Extended Universe (DCEU). Shazam! follows 14-year-old orphan Billy Batson (Asher Angel), who gains the ability to turn into an adult superhero (Zachary Levi) by an ancient wizard (Djimon Hounsou). With the help of his foster brother Freddie (Jack Dylan Grazer), Billy tries to master his powers and stop villainous Thaddeus Sivana (Mark Strong). After being stuck in development since the early 2000s, Shazam! feels like it is playing catch-up with the rest of the superhero genre. There have been a lot of origin films during the last decade alone so Shazam! needed to bring something different to the table to make it stand out. Instead, it delivers something recognisable. Henry Gayden’s screenplay combines Shazam’s roots from the early DC comics with a modern twist, which barely conceals the familiarity of the orphaned hero looking for stability and the power-mad villain. Despite the unoriginal plot and occasional predictable moment, the narrative offers an identifiable formula and a base to experiment with and develop – essential when establishing a ‘new’ superhero. After years of adult superheroes, it is great to see another young comic book character getting the cinematic origin treatment. While Peter Parker has been bitten numerous times, Billy Batson is finally making his big screen debut since his creation in the 1930s. Introduced as a sharp-witted kid, he hides his emotions and avoids attaching to other people by being rebellious. This continues when he is granted superpowers. Looking like an adult, he assumes he can get away with doing whatever he wants. But like the child that he is, he doesn’t really understand the potential of his abilities – after all, with great power comes great responsibility. So when the equally strong Sivana comes onto the scene, Billy is forced to grow up and realise that he has to do more with his superpowers. Combining honed comedic talent and likeable charm, MCU alumni Levi makes Shazam his own as he brilliantly plays the awkward superhero-in-training. He also shares a great rapport with Grazer, who uses every moment to amusingly geek out in his performance as Freddie. However, Strong’s Sivana comes across as one-dimensional but is involved in some of the film’s most memorable moments. Following in the footsteps of James Wan, Annabelle: Creation director David F. Sandberg effectively steps out of the Conjuring Universe to deliver an eye-catching caper. Sandberg’s efforts are also complemented by smart dialogue and little details that are sure to appease fans. It is hard not to ignore the similarities between Shazam! and practically every other superhero film. However, it offers laughs, fights and a brilliant lead performance by Levi, making it the most entertaining instalment of the DCEU so far. Shazam! is out in UK cinemas on 5 April 2019.